Our qualified technician at Fridge0 Refrigeration will come to you with same day service throughout Melbourne's Eastern and South Eastern suburbs. 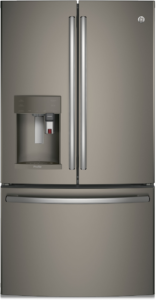 We repair and service all makes of GE refrigerators with no call out fee! General Electric refrigeration has been around over 50 years and has originated from the USA. Even though G.E. has the full range of refrigerator designs, the most common range is the Side by Side refrigerator. The electronic features offer greater functionality with your unit but can pose problems when your GE fridge starts playing up. There are some minor things you can fix quite easily using the troubleshooting links on the GE Appliance website (like some minor ice maker problems and filter purging) but with built-in electronics for more serious problems you will need to seek professional help for your GE fridge repairs. Older versions of the GE refrigerator (20 yr) are basic and encounter few major issues, that being said when they do encounter a compressor failure or gas leak it is usually time to upgrade due to the cost of the repair and the age of the unit. Most common issues with the older units are defrost failure. Symptoms are Freezer seems to be OK but the refrigerator isn’t as cold as it used to be and/or top part of the freezer isn’t as cold as the bottom part of the freezer. This is all due to the freezer evaporator coil being iced up and blocked with ice, blocking any air flow from the freezer to the refrigerator and stopping air flow from bottom to top of the freezer itself. Most common component that causes this is the heater / heaters located on the freezer evaporator coil. Second most common cause of defrost failure is the termination thermostat which is usually located on top of the freezer evaporator coil. Third most common is the timer itself. If the refrigerator unit is tripping the safety switch, this can be caused by the heaters and or termination thermostat. The more recent models have much more electronics integrated into them with sensors instead of conventional thermostats. This leads itself to more issues unfortunately which are also more involved in diagnosing the problem. Basically, all of the above applies to the electronic models with additional problems. If one has worked out that the refrigerator is not defrosting and has blocked up with ice , first the heaters and termination thermostats need to be checked to make sure that they have the correct values before looking further. Next the freezer sensors need to be checked for the correct value, (hint usually there is a schematic diagram with information located under the fridge or values of sensors can be found online with the aid of the model number of your refrigerator. If the sensors checked ok with the correct value then it is time to replace or repair the main board. If your GE refrigerator new or old is tripping the safety switch or circuit breaker, the most common reason for this is a faulty defrost heating element/ elements located inside the freezer on the back wall behind a metal or plastic cover depending on which model. Second most common item that will cause the circuit breaker to trip is the termination thermostat also located above the defrost heaters. Third most common item cause the safety switch to trip would be the compressor which is the main motor . The items above listed are the most common to cause the issue discussed but are not always the case. There are many other possible issues that can cause the refrigerator to trip the circuit breaker, the issues listed are just the most common. We service GE freezers & refrigerators – including GE Profile and Hotpoint models – around Melbourne's southern and eastern suburbs.